Reprice is an ad-supported program that our researchers have discovered to be built using the Kango engine. The official download page of this suspicious program is reprice.us, and it offers the product for all of the popular browsers, including Internet Explorer, Mozilla Firefox, and, of course, Google Chrome. 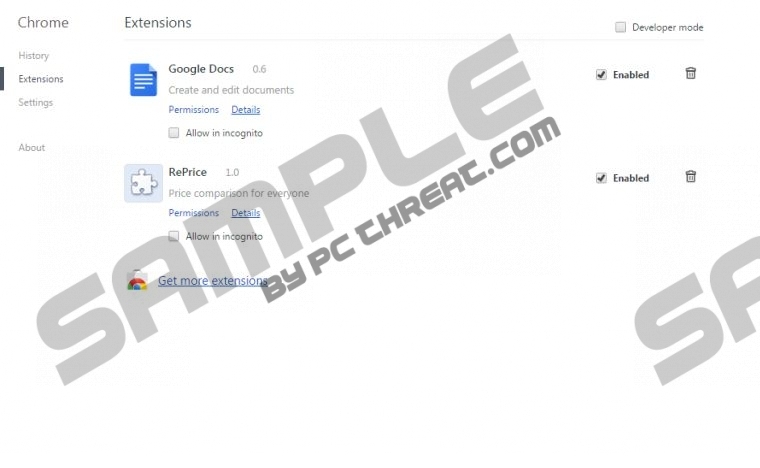 If you choose to download the extension for Chrome, you will not need to remove Reprice from your PC, which is different for the users of the IE and Firefox browsers. Luckily, we know how to delete the application from whichever web browser that gets affected by this adware. According to our researchers, Reprice has been created by Monetizus, and you can learn more about the company at monetizus.com. It is also important to review the information presented on reprice.us. Of course, you should not pay attention to the promotional information, because it is set up to lure customers in, not reveal the reasons to remove it. Even though Reprice is promoted as a “price suggester,” our researchers have identified it as an advertisement-supported program for a reason. If you review the privacy-related document found at reprice.us/privacy, you will learn that the program can display third-party offers, and this is why you may want to delete the application. Unfortunately, the banner and pop-up advertisements that you might recognize as “Offers by RePrice” are not reliable. The main reason why we recommend deleting Reprice is the unreliability of the ads that could be presented by virtually anyone, including schemers and parties working with malware distributors. Most advertisements associated with Reprice are served via prosperant.com. This is yet another company that you need to research before deciding whether you can trust Reprice or whether you should delete it. Even if the links presented by the app are authentic and the services offered via them are trustworthy, you need to realize that you could face some security issues. For example, if Reprice displayed an ad routing to an unreliable website that promotes links to corrupted sites, you could be indirectly introduced to the activity of cyber criminals. This is why we urge computer users to delete adware. Do not hesitate to delete Reprice, because this is not a beneficial program, especially if you are trying to get the best deals. If you want to save money and find the best discounts and offers, you need to sit down and start browsing the web yourself. Do not trust free applications that conduct automated discount searches, because it is most likely that you will be presented with the offers of the affiliate parties. To remove Reprice you can use the removal instructions below, or you can install an automatic malware removal application that will delete the undesirable software automatically. Open the Charm Bar and click the Search icon to open a dialog box. Click the Windows/Start button on the Taskbar to open a menu. Select More tools (or Tools) and click Extensions. Click the trash icon associated with Reprice and select Remove. Quick & tested solution for Reprice removal.